We’ve got a lot of ground to cover in the next few weeks, including more people describing their rides, and an in-depth look at bike collision stats. And come back later today when we’ll announce BikinginLA’s first-ever free bicycle giveaway, courtesy of Hermosa Beach’s Beachbikes.net. Now make yourself comfortable. We’ve got a lot of news to catch up on. 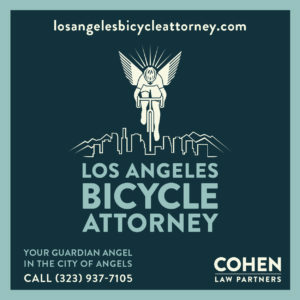 Several recent news stories have focused changes in the laws affecting bike riders, particularly a ban on headphones and a requirement for bicyclists to pull over when they’re blocking traffic. Except neither one is really new. It was already illegal for bike riders, as well as drivers, to use headphones or earpieces in both ears; the new law only removes some loopholes by prohibiting any kind of earpiece on or in both ears, whether or not they’re actually in use. Similarly, bikes were already covered under the existing requirement for slow moving vehicles to pull over to allow others to pass. The only change is explicitly adding the word bicycles to the law. However, the law only applies on two-lane roadways when five or more vehicles are trapped behind and unable to pass; if cars can safely go around, the law doesn’t apply. And you’re not required to pull over until it’s safe to do so. You also don’t have to move over for speeding drivers if you’re riding at or near the speed limit. The problem is most of the news stories fail to give adequate context or explain the limitations of the law, or point out that nothing has changed other than adding bicycles to the wording. Which means we’re likely to see a jump in angry drivers demanding that bike riders get the hell out of their way, regardless of how many lanes there are or whether they can actually go around. Correction: Serge Issakov, board member and secretary for the California Association of Bicycling Organizations, writes to correct the information about bicycle’s being added to the turnout law. According to Serge, not only has the story been blown out of proportion, it isn’t even a story to begin with. And he should know, since he provided the wording that was adopted, without changes, by the legislature. See if you can spot it anywhere in the revised law. On a two-lane highway where passing is unsafe because of traffic in the opposite direction or other conditions, any vehicle proceeding upon the highway at a speed less than the normal speed of traffic moving in the same direction at that time, behind which five or more vehicles are formed in line, shall turn off the roadway at the nearest place designated as a turnout by signs erected by the authority having jurisdiction over the highway, or wherever sufficient area for a safe turnout exists, in order to permit the vehicles following it to proceed. I apologize for my error. Unfortunately, with all the madness over the holidays, personal and otherwise, I’m not sure where I got the information I used; regardless, it’s my fault for relying on a single source rather than verifying what I was told. But a better question might be why the CHP is blatantly misrepresenting the the law. Thanks to Serge for the correction. In other law changes, e-bikes are officially legal and allowed on bike paths; so are hoverboards. A Hermosa Beach bike rider is looking for the hit-and-run driver who left him with a broken arm in Rolling Hills Estates on Christmas Eve; unfortunately, there’s not much of a description to go on. Then again, not even ghost bikes are safe from hit-and-run drivers; this one was at the site where Reynaldo Barajas was killed in Oxnard. While we were gone, the Internet blew up over this video of bicyclists behaving badly on the popular Nichols Canyon Ride. Cycling in the South Bay says behavior like this has to change because it’s better to attend post-ride coffee than a post-ride funeral. And Bike Newport Beach says this isn’t what we should be teaching young riders. If you want my take, just don’t ride like a jerk. Ever. Ride faster. A new British study shows that slower bicyclists are more likely to be in a collision; people who ride at eight mph or less are three times more likely to get hit by a car than those who ride 12 mph or faster. And in what may be the most important cycling study ever, German researchers have determined that saffron supplements can help prevent sperm damage caused by bicycling. A powerful Australian ad uses a purposely misaligned bicycle as a metaphor to demonstrate what it’s like to have MS. The LA Times’ Christopher Hawkins calls for converting the end of the 2 Freeway into an elevated park and solar arrays, along with a bikeway offering spectacular views. Meanwhile, an OpEd in the Times calls for closing a stretch of Hollywood Blvd at Hollywood and Highland to cars to create a much needed pedestrian plaza. Yes, to both. Boyonabike looks at the best of bike and alternative transit news in 2015 and his hopes for the year to come, while CiclaValley looks back at the year in pictures. There’s still one day left to vote for this year’s Streetsie Awards, including Advocacy Group, Advocate, Journalist/Writer, Civil Servant, and Livable Streets-Friendly Business of the year. Evidently, I’m a nominee emeritus. Local residents pitch in to buy gifts and a new bicycle for a Redondo Beach family that lost their home in a fire just before Christmas. Caltrans issues design guidelines for cycle tracks, while Calbike reports on their accomplishments for the past year. A San Diego man had his bike stolen when he was beaten by a half dozen men at a trolley station. 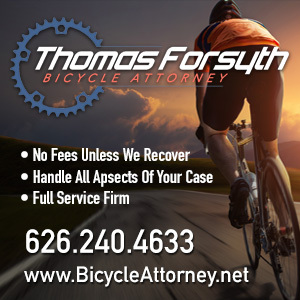 A San Antonio website offers an in-depth analysis of the road conditions that led to a $5.8 million judgment the death of an Indian Wells bicyclist, concluding that 94% of traffic fatalities in the city are due to poor road design. And says the solution is slower speeds resulting from narrowing lanes and building more intersections. The Jewish Journal takes an “epic” 29-mile bike ride from Ventura to Santa Barbara. Epic being a relative term; your epic ride might be someone else’s easy day. Or vice versa. Sad news from San Jose, as a man became the state’s first bicycling fatality of 2016 in a collision between two cars on Saturday. Also from San Jose, a man calls for bikes to be banned on a local highway; cyclists say they aren’t the problem, while a columnist fails to grasp that we all pay for the roads, whether or not we drive a car. A Sacramento cyclist gets his stolen cargo bike back a week after it disappeared, after another rider spotted the distinctive bicycle across the river. A bighearted Napa man sets out “karma kits” with tubes, air pump, energy bars and trash bags along popular riding trails for cyclists in need. City Lab lists 10 traffic myths that should have gone away in 2015, but didn’t, including that bikeways slow traffic and drivers pay for the roads. See San Jose above. The NFL is discovering what we already know. If you really want to get in shape, ride a bike; evidently, it works for the other kind of football, too. Okay, it’s a little late for New Year’s, but it still helps to know how to ride with a hangover. Which is one of those key cycling skills every imbibing bike rider should master. A noncom officer with the Oregon National Guard during the week, rising pro cyclist on the weekend. A new protected bike lane in Lincoln NE is popular with bike riders, as well as the drivers it’s supposed to keep out. Bicycling talks with former New York DOT Commissioner Janette Sadik-Khan on how she transformed Gotham into a bike and pedestrian friendly city, even if not every driver gets it. Let’s hope LADOT gets it; we’re all still waiting to see similar changes on our own streets. Massachusetts is considering a series of bike friendly bills, including a ban on parking in bike lanes and requiring side guards on trucks. A historian puts the dispute over DC bike lanes in the context of the gentrification of a traditionally African American neighborhood. North Carolina considers a series of anti-bike regulations, including forbidding cyclists from taking the lane, and requiring permits for large informal group rides. Florida considers requiring solar-powered lights on any new bike paths. Evidently, streets are no-fun zones limited to transport only, so bicyclists need to ride sedately. And after a whopping 125 London cyclists are convicted of blowing stops — in a city of 8.5 million — the same paper calls it a crackdown on “bully boys on bikes.” No, seriously. A woman from the UK sets out to set a new women’s year record. Caught on video: A London paper is inspired by a dog clinging to his bike-riding owner’s back. Of course, if that was a child they’d be after the cyclist’s head. The BBC traces the British bike boom back to the 2005 London subway bombing; over two million people in the country ride at least once a week. Once again, someone has sabotaged an English bike path; a man riding with his toddler in a trailer was nearly garroted by a wire strung at neck height across the trail. Acts like this aren’t pranks — they’re deliberate attempts to seriously injure or intimidate riders to frighten them off trails they’re legally entitled to use. Now that’s a bicycling superhighway. Germany has approved plans for a 62 mile bikeway connecting ten cities and four universities; the first five kilometer stretch has already opened. Cycling is more popular than soccer among Spaniards. Cyclists in Malta say drivers have to be held accountable, and call for adoption of a presumed liability law; the tiny island nation is one of just five countries in the European Union that hasn’t adopted some form of the law. The best way to promote bicycling in Abu Dhabi — or anywhere else, for that matter — is to teach it in schools and instill a passion for riding in families. Try not to fall off your bike while riding Down Under when you’re four sheets to the wind, or over six times the legal limit. And try to keep breathing, while you’re at it. A Thai nurse gave up her vacation to save the life of a German bike tourist who suffered a heart attack. Who needs an e-bike when your car’s rear wheel can convert to an electric unicycle? If you can’t beat ‘em, join ‘em; if someone steals your bike for the third time, just go out and steal a replacement. And despite what the press says, having an erection in public while wearing spandex makes you an exhibitionist, not a cyclist. But maybe he really did have a banana in his pocket. 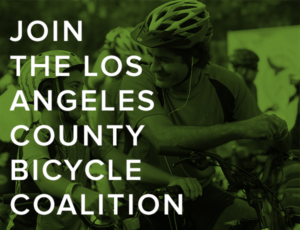 Thanks to Mark Jones for making 2015’s last donation to BikinginLA. While the Holiday Fund Drive is over, you can still contribute anytime. And despite what the press says, having an erection in public while wearing spandex makes you an exhibitionist, not a cyclist. I’m pretty sure that picture was Photoshopped or otherwise staged, but it still made me LMAO! 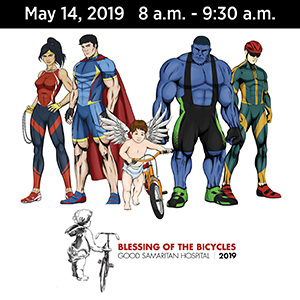 I suspect that the reason that slow bikers are more likely to be in a collision has nothing to do with their speed and everything to do with the fact that they are more likely to ride against traffic, move across lanes without signalling or even checking for traffic, run red lights and lots of other dangerous behaviors. Faster riders tend to be more experienced and less likely to do stupid things. They are also more likely to be educated in bike safety. Sadly, I’ve seen fast riders do all of those dangerous things, but overall I think you’re right. The change in the law was removing the word “motor” from in front of the word “vehicle”. Previously the law did not apply to bicycles because they are not motor vehicles. And unless the wording of other laws has also changed it still doesn’t apply, because bicycles have the rights and privileges of vehicles but are still not legally called vehicles.